When 17 year-old Hinano asks his name he says it's 'k', because his real name is too long. K aka 'four eyes' wanders the Tokyo streets as a moral robin hood, teaching a lesson to those he feels need one. He does this by pretending to shoot his victims, but the gun has a modified crooked barrel plus he wears special glasses to make sure he misses. When he faces them and pulls the trigger, they all faint from shock and mortal fear, which to him is the ultimate punishment. Hinano is fascinated by him, even more so because her brother is a detective in the Tokyo police department, working on the 'four eyes' case. She stalks him, they meet, and fall in love. Well actually she falls in love with him, but more on that later. They complement each other, as illustrated by a scene in which Hinano helps out an Iranian family at the mercy of a racist bus driver. K looks all proud of her, and that same night decides to teach the bus driver a lesson. But ultimately, she doesn't approve of his methods, and convinces him to stop it and get rid of the gun. Well that's pretty much the story, except for a surprising and off-beat ending which I won't spoil for you. While the whole idea of the gun and the punishment is interesting, it's still a fairly standard story at first sight, that might even work better as a short film. But there are a couple of things that make it worth it's 90-minute running time. First there's the atmosphere. I've never been to Tokyo, but watching this film you are there. Even if you don't care for the story, you can view the film as a detailed report of people living in this urban jungle, and how they go about their daily lives. There's a lot of footage of people just walking the streets, like the long hand-held pov shot near the end of k and Hinano walking through the shopping district at night. It's one of my favorite scenes. Second, and this is something i didn't even notice until another review pointed it out, the gay subtext. K (pronounced as in English) has a certain gay mannerism, and he doesn't seem to be very interested in Hinano. Instead he's curious about her brother, and delighted when she describes him as a man with feminine features. And there's a scene where a stranger asks him for a light that could be interpreted in more than one way. It's all pretty subtle but very interesting, and it really lifts the story above the ordinary. Acting is solid. Not stellar performances by any means, but charming and perfect for the film. Hinano Yoshikawa is cute beyond repair as Hinano. The scene where she has sticky tape stuck to her hand and hysterically tries to shake it off while making the cutest noises is priceless. Shinji Takeda plays k as an ultra-cool cartoon character. Plus he has the most amazing haircut. There's also a cameo by Takeshi Kitano, which was okay. TOKYO EYES was written and directed by French filmmaker Jean-Pierre Limosin. He shot mostly hand-held, which i always love. 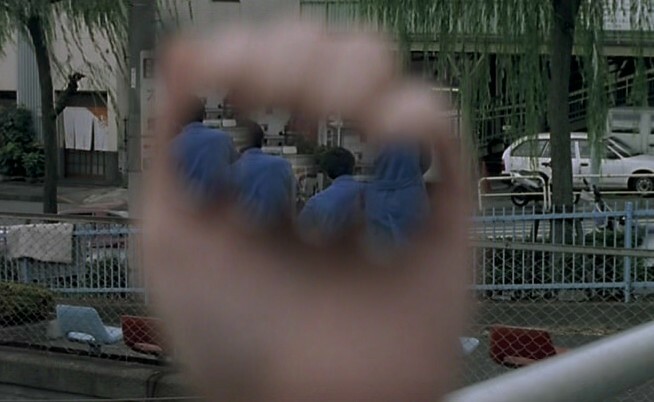 Photography is pretty straightforward, but some shots like the aforementioned pov and the shot where Hinano uses her nail varnish as a mirror are quite striking. The soundtrack is excellent. Loaded with squarepusher-esque late nineties techno by Xavier Jamaux, it's the literal heartbeat of the film. A region 3 DVD of TOKYO EYES also exists with English subtitles but it isn't 16:9 enhanced, so I went for the French region 2 release. Region 2 pal, oar 1.66:1, 16:9 enhanced, film-sourced, Dolby surround sound. You can watch it either in Japanese with forced (not burnt-in) French subtitles or with the French dub and no subtitles. I've been told these forced subtitles can be removed on stand-alone hacked Sony players, but on my htpc it didn't work. No problem since i need the subtitles anyway. Picture quality is good not great. Edge enhancement is not as bad as on most region 1 titles, but it's still visible most of the time both as halos around darker objects and as a lack of detail in wider shots. Pal DVD's have 20% more resolution than ntsc ones, but the edge enhancement prevents this from ending up on the screen. Fortunately there are a lot of close-ups, so subjectively the picture still looks pretty sharp. Shadow detail is another problem. It isn't very good, not even in brighter scenes. When a person is wearing multiple layers of black clothes in a bright room, i expect to see lots of detail in the black, instead it's just one black area. As you can imagine this makes dark scenes look flat and compressed. Colors aren't perfect either. They appear washed-out and there's the typical tf1 video slight yellow cast over the picture. There's also a lot of grain, but that doesn't bother me. Normal people with normal setups probably won't even notice all these 'problems' and think the picture looks great, but front projector owners should take notice. The Dolby surround track sounds surprisingly good, with some very low bass in the opening title music. All the other music sounds great as well. Dialogue levels are a little uneven at times. Didn't notice much surround activity, thank god. The DVD menu has loud and irritating animations. Extras include the trailer, a totally out of place text-only introduction to manga, and an excellent 42-minute documentary about Tokyo. Really this is so good it could be released on a DVD by itself. It's shot by the director on dv, with a French voice-over and with French subtitles. A very nice surprise.